February « 2015 « Write, or Else! The Busan Writing Club book is now on Kindle! I’ve just confirmed – the group publication by the Busan Writing Group is now live and avaialable for sale through Kindle. I’m really glad to have been a part of it, and to have figured out all the formatting needed to get it looking great on Smashwords, Kindle, and in print! An Amazon Kindle release will be added soon! 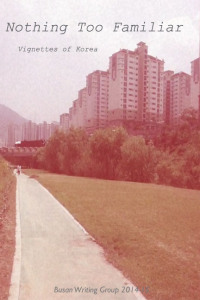 It’s been a long time in coming, but the Busan Writing Group is ready to announce our new book, Nothing Too Familiar. This is a collection of works reflecting writerly experiences in South Korea. These works were selected and compiled from our group of writers over the past several months. This book includes the work of Michael Geer, Chris Edwards, and Stephan Viau. This is the first of what we hope will be an annual publication – that means that YOU can have your story in the next one. Come out and join us, work with us, and we’ll all be a part of this writing and publishing adventure together. Printed copies of Nothing Too Familiar will be coming to Busan soon! I’m sure you’ve heard it said over and over again how important it is to get the next book out. One of the most effective marketing techniques out there is to publish the next book. Ideally, this will be a compelling story, but in order to create a compelling story, you need to be energized. If you’re facing burnout, your work (and other areas of your life) will suffer. A couple of quick indicators that you might be facing burnout are trouble sleeping, lack of energy/excitement, trouble focusing, headaches, increased illness (ex. you get a head cold easier), irritability, and anxiety. Having any of these once in a while isn’t cause for alarm. But when you notice this is an ongoing thing, you’re probably facing burnout. What are some causes of burnout? Doing too much, lack of sales, lack of social support, doing work you’re not passionate about, and negative feedback. The good news is you can take measures to avoid burnout (or, if you’re currently in the middle of it, pull yourself out). This is something you have control over. Here are some tips to avoid burnout. My first #IWSG of 2015 – A writing club that self-publishes together! Things are certainly heating up for the Busan writing group. We are planning out an anthology of works to publish very soon! We envision this as an annual publication by our group – we will collect stories that we have reviewed and edited together for a self-published anthology. I’m posting this to the Insecure Writer’s Support Group this month because I think this is an option for self-publishing that is not discussed often enough in writing circles. Once you have a writing circle that you work with regualrly, one possible direction foir your group is to publish together. Editing, formatting, production, promoting, etc. – all those things could be done as a group, with members sharing the tasks. So from the IWSG community, I’d like to know: have you done a group publication before? How did it go? More updates on my own group’s publication are coming as soon as I can say more. I’ll only say this – I’m quite happy with the submissions we have lined up, including my own work. I feel my piece is the best and most polished work of fiction I’ve done yet.